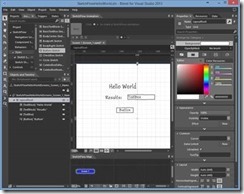 SketchFlow enables rapid creating of dynamic interface mockups very quickly. The SketchFlow workspace is the same as the standard Blend workspace with the inclusion of three panels: the SketchFlow Feedback panel, the SketchFlow Animation panel and the SketchFlow Map panel. By using SketchFlow to prototype, you can get feedback early in the process. It helps to surface possible issues, lower development iterations, and increase stakeholder buy in. SketchFlow prototypes not only provide an initial look but also provide a way to add additional ideas and input and make sure the team is on track prior to investing in complete development. When you have completed the prototyping, you can discard the prototype and just use the lessons learned to design the application from or extract individual elements from your prototype and include them in the application. I don’t recommend trying to transition the entire project into a development project. 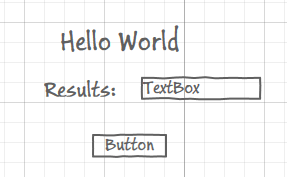 Objects that you add with the SketchFlow style have a hand-sketched look. The sketch style is used to remind stakeholders that this is a prototype. This encourages them to focus on the flow and functionality without getting distracted by design details. The sketchflow assets are under sketchflow in the asset panel and are identifiable by the postfix “–Sketch”. For example “Button-Sketch”. You can mix sketch and standard controls in your interface, if required. Be creative, if there is a missing control or your interface has a different look and feel than the out of the box one, reuse other sketch controls to mimic the functionality or look and feel. Only use standard controls if it doesn’t distract from the idea that this is a prototype and not a standard application. The SketchFlow Map panel provides information about the structure of your application. 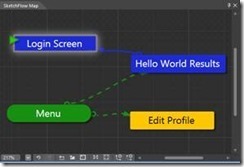 To create a new screen in your prototype: Right-click the map surface and choose “Create a Connected Screen”. Name the screens with names that are meaningful to the stakeholders. The start screen is the one that has the green arrow. To change the start screen, right click on any other screen and set to start screen. Only one screen can be the start screen at a time. 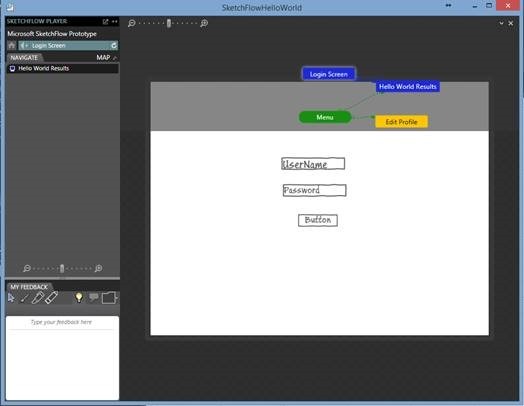 Rounded screen are component screens to mimic reusable custom controls that will be built into the final application. You can change the colors of all of the boxes and should use colors to create functional groupings. 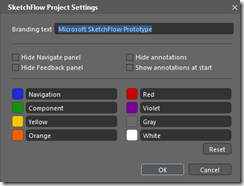 The groupings can be identified in the SketchFlow Project Settings. To add connections between screens in the SketchFlow Map panel. 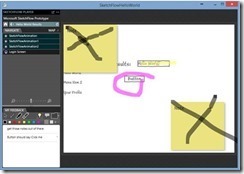 Move the mouse over a screen in the SketchFlow and a menu will appear at the bottom of the screen node. In the menu, click Connect to an existing screen. Drag the arrow to another screen on the Map. 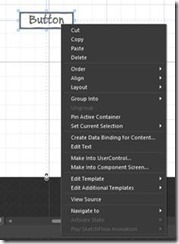 You add navigation to your prototype by adding connections on the SketchFlow map or by adding navigation directly to items on your interface. To add navigation from objects on the artboard, right click the item then from the menu, choose “Navigate to”. This will expose a sub-menu with available screens, backward, or forward. 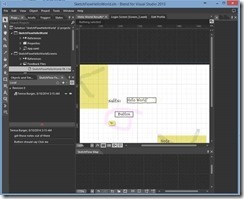 When the map has connected screens, the SketchFlow Player displays the connected screens on the Navigate sidebar. All screens show in the SketchFlow Player Map. 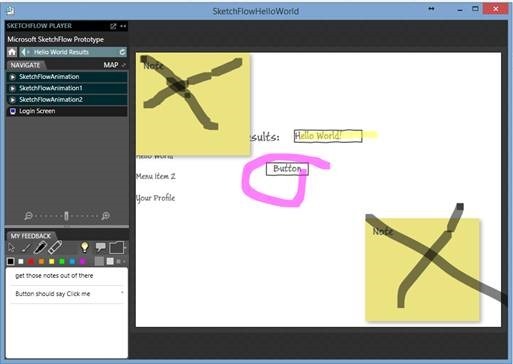 To see the SketchFlow Player, run your SketchFlow prototype. The Navigation sidebar is meant to show the desired user work flow. The map can be used to view the different screens regardless of suggested navigation in the navigation bar. The map is able to be hidden and shown. As mentioned, a component screen is a shared screen that is used in more than one screen and generally represents what will be a custom object in the application. To create a component screen, you can create a screen, right click on it in the SketchFlow Map and choose “Make into component screen”. 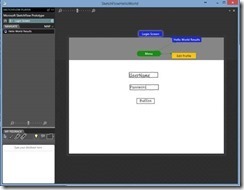 You can mouse over a screen and from the menu that appears underneath, choose create and insert component screen. To use an existing screen, select if from the Asset panel under SketchFlow, Components. You can use Storyboards and Visual State animations in your SketchFlow project. However, SketchFlow also offers its own animation technique that is simpler and better suited for prototyping. The SketchFlow Animation panel is above your artboard by default. 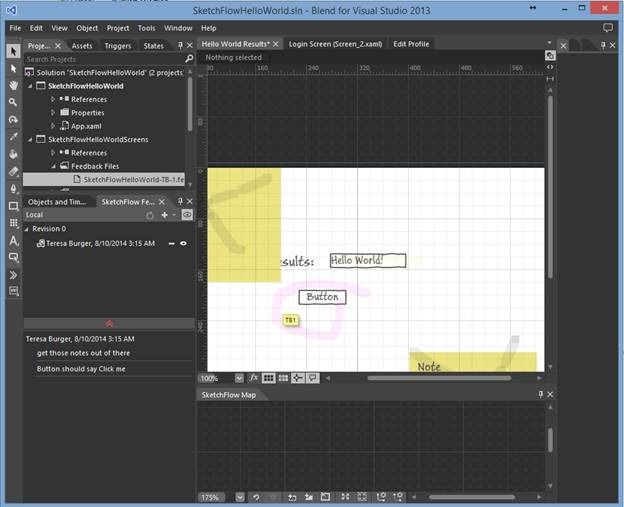 In SketchFlow animation, you create frames and then position the elements on your interface for each frame. You then specify elapsed time and any effects you want to apply to the transition. The + at the top is what creates new frames. Once you have a new Frame, select it and change the property you want to animate. In the example above, I changed the Text of the result box. You can adjust the time between frames in the lower area between the frames. The easing and effects functions are changed in the center between each frame. You edit the hold time for frames by clicking the clock icon in the lower left and the hold time will appear on each frame and can be edited. The FluidLayout icon (also located in the lower left) will create smooth transitions. Next to the FluidLayout icon is the name of that Animation. You can rename the animation by clicking on it and editing the name. The down arrow chevrons next to the name allow you to view the list of all animations in this prototype and select them for editing. 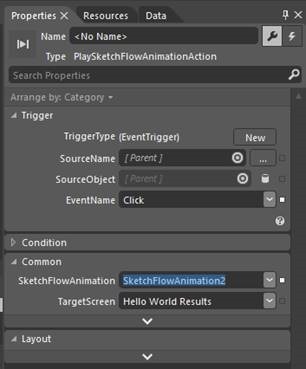 To add the animation to the interface object (such as a button to start the animation), select the PlaySketchFlowAnimationAction from the SketchFlow behaviors in the Assets menu and drag it to an object on your interface. 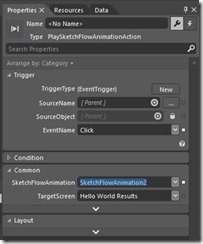 With the PlaySketchFlowAnimationAction that you just added selected in the Objects and Timeline, edit the properties to change the EventName to the event you want and choose the SketchFlowAnimation you want from the drop down list. You may want to add additional information to your screens that isn’t really part of the prototype but is relevant information or a request for clarification or feedback from the reviewer. You do this with annotations or notes. Both appear on the user interface, however, annotations can be switched on or off at design and review time. Notes cannot be switched off. To add an Annotation, chose the Create Annotation from the Tools menu. The annotation appears on the UI where you will add the notes. To display or Hide annotations, click the annotation toggle at the bottom right on the artboard . After to toggle annotations on, the identifier of the person who created them appears on the artboard and you must click that to expand the notes. To add a note to the artboard, simply select the Note-Sketch from Assets ->SketchFlow ->Styles ->Sketch Styles. Drag and drop it to the artboard and place where you want it. When you are ready for users to review the prototype, you have a few options available. 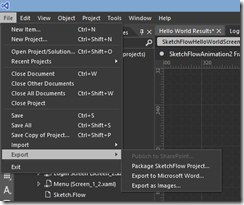 Click File -> Export and choose one of the options from the list: Publish to Sharepoint, Package SketchFlowProject, Export to Microsoft Word, or Export as Images. I suggest you play with as many of the options as you can to see what they do. 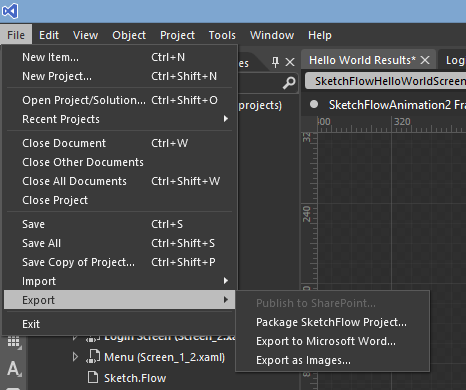 Both the Sharepoint and Packaged SketchFlowProject allow you to collect feedback from one or more users that you can import into the project. The user can make notes on the UI and in the Feedback area in the bottom left corner of the player. When the user is done adding feedback, it is exported from the right most folder icon in the My Feedback panel. Feeback is imported on a panel named SketchFlow Feedback. To get that panel to show up, select Window -> SketchFlow Feedback. Once you have the panel showing, click the + in the upper right of the panel and find the notes you exported. When imported, they will show up in a list and on the artboard. To document your prototype, use the Export to Microsoft Word option from the File menu. That should get you started with prototyping.